Last Thursday was quite the busy and tiring day if I remember it correctly. Sam didn’t have school and so after we dropped Jamie off, we went on our Mom-Sam breakfast date. She was so cute – she purposely didn’t eat breakfast because she knew we had time that morning. Afterwards it was a mad dash to some meetings and when I got home in time for their swim lessons, the girls asked me to swim. I’ve been having a lot of mom-guilt lately so I complied, even if my body was aching and tired from a previous exercise. Then, we made a mad dash over to SM Megamall and braved the rush hour traffic because I had promised Sam we’d attend the opening of my aunt’s exhibit. Yes, I pretty much do anything for my kids. This was out of our usual routine since it’s normally an early dinner and bedtime for the girls but we made the exception for this special occasion. Sam loves painting and wants to be a painter someday like her Nona Migs. 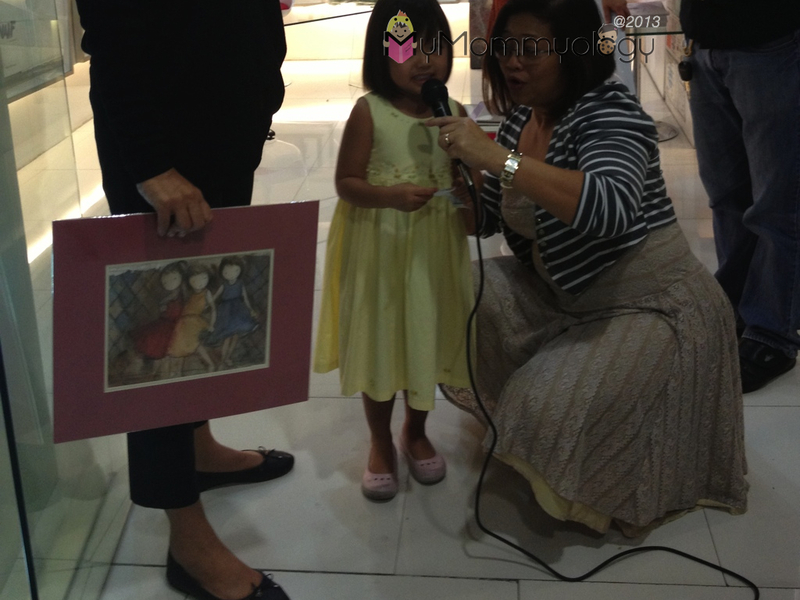 I’m so glad she loves art, and that we have Nona Migs to help fuel that interest in her. Nona Migs is better known as Migs Villanueva. 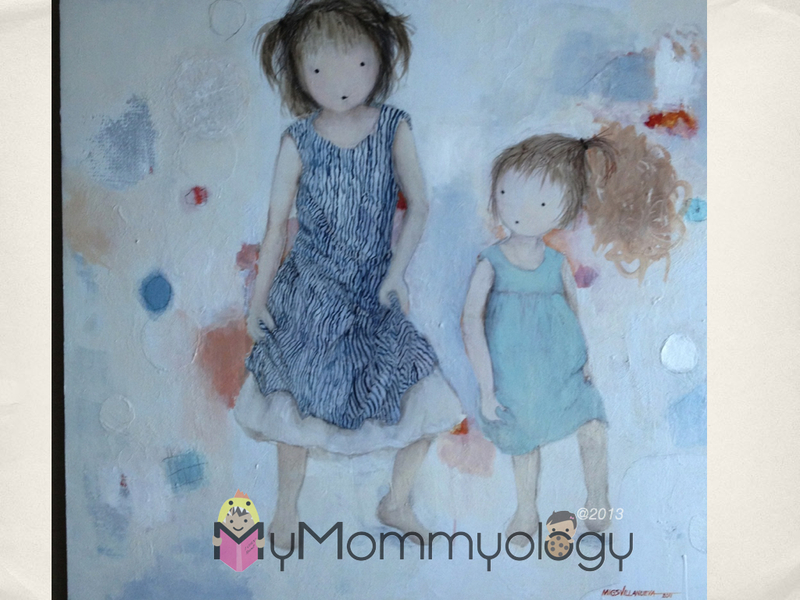 She is the creator and painter of our living room’s centerpiece, one we all love, because it is of Sam and Jamie. The centerpiece in our living room. It was her 4th one-woman show last Thursday at Galerie Francesca, entitled Paraphrasing Memory. It was quite surreal looking at all the images. I can’t put it into words, but from the feel of her work the exhibit’s title makes sense. This is Nona Migs, her book and her beautiful paintings. More from the gallery. Go visit and see for yourself! Her work is beautiful, and you can feel that each one is made with a lot of heart. She’s made a distinct impact in the artistic world already in such a short span of time. Everyone talks about her unique point of view and distinct style, and when people see it they know that it’s a Villanueva. In fact, the painting that hangs in our home often catches every visitors’ attention. They get wide-eyed and enthusiastic and ask where we got it or how. I humbly (but proudly) say that it was a gift, and that we’re very lucky to own such a piece. In fact, my husband keeps the plastic over it in fear that Sam or Jamie, in their “inspired artistic states”, will decide to add to the painting when we’re not looking! 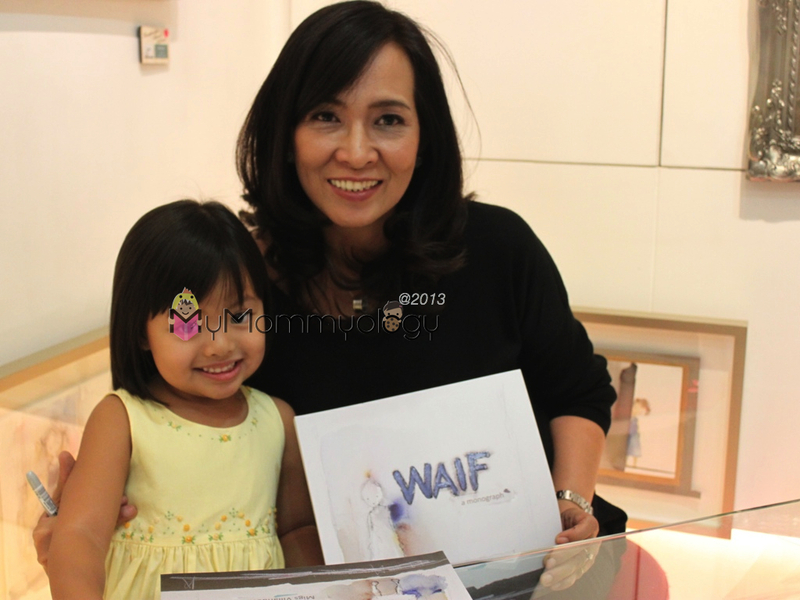 That Thursday Tita Migs also launched her book entitled Waif. Nona Migs and Sam, with her very own signed copy of the book. I didn’t know what it meant until Tita Migs explained that she took inspiration from orphaned children. According to Wikipedia, orphaned children left to fend for themselves, are commonly literature protagonists. 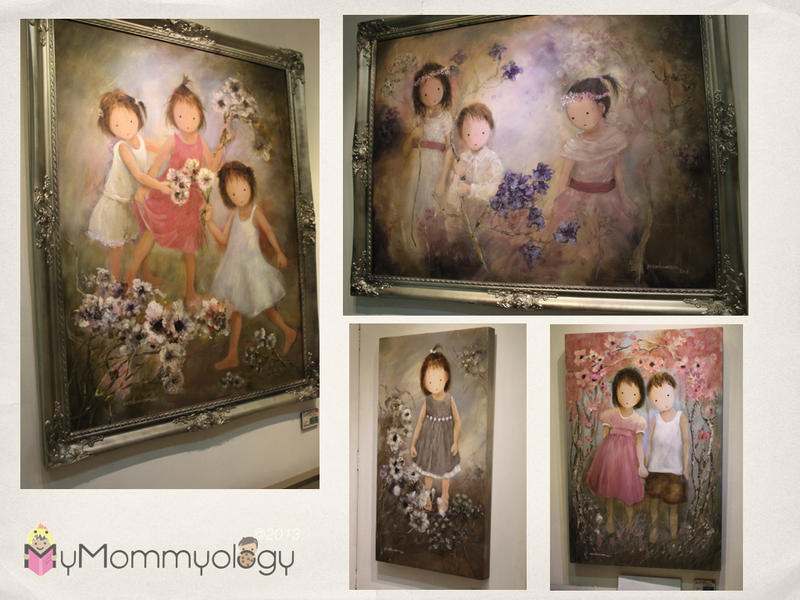 Through Tita Migs’ work, they’ve actually become artistic protagonists too. Incidentally, the book is on sale at Gallery Francesca for P1,500. 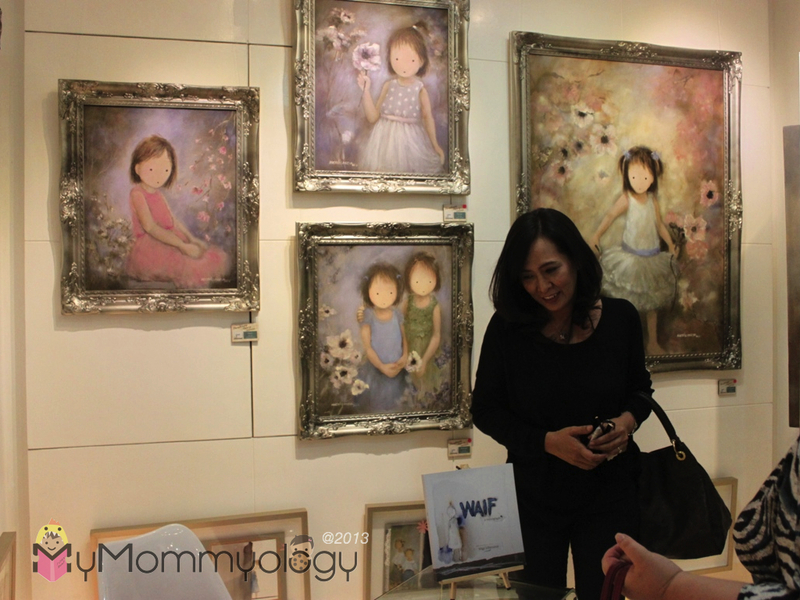 It’s a great way to own a copy of Tita Migs’ work, and to understand the inspiration behind her previous pieces. When the curator of the gallery announced that Tita Migs was open to signing copies of her book, Sam didn’t hesitate. She stood patiently in line with the rest of them and picked up a book for herself. She told Tita Migs, “please write to Sam and Jamie.” We got a copy for my mom too, since she’s been wanting to own some of Tita Migs’ work. That night every purchase of the book garnered buyers a raffle stub, for a chance to win one of 10 of Tita Migs’ water-colored Waifs. Time to go and see it! 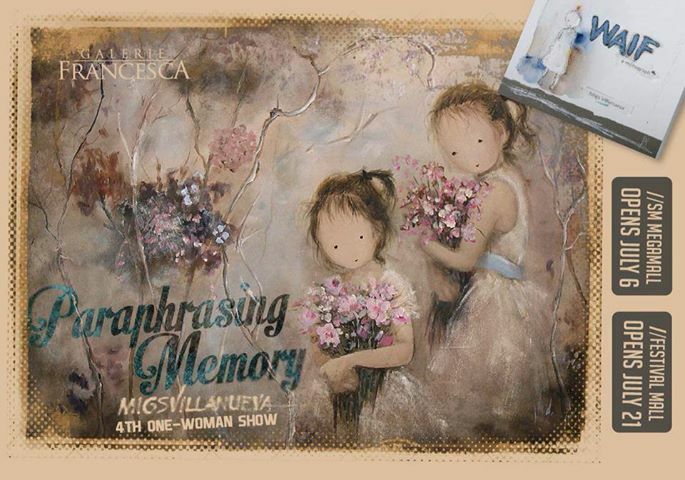 Tita Migs’ Paraphrasing Memory 4th One-Woman Show will be at the Galerie Francesca, Festival Mall beginning July 21. I seriously recommend you check it out. It’s worth breaking the usual routine for.